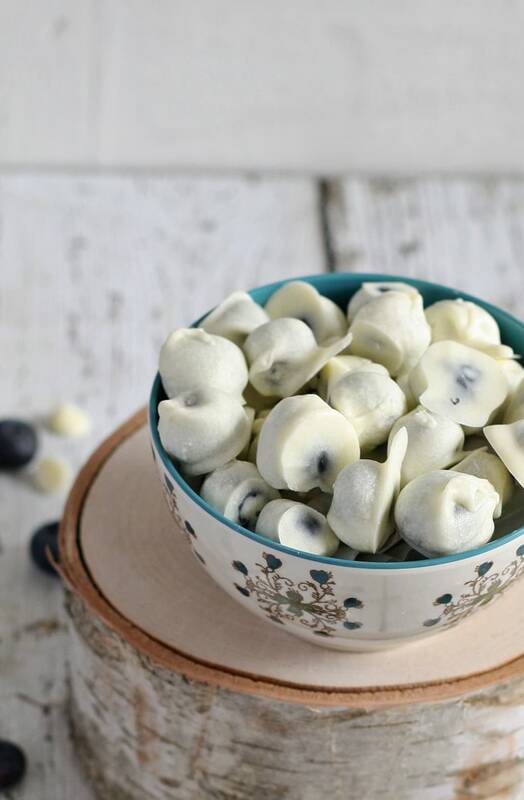 White chocolate covered blueberries are easy to make and perfect for dessert or a quick snack. 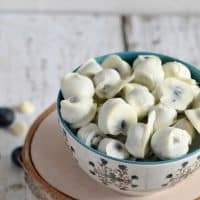 These white chocolate covered blueberries are fantastic, and easy to make. Sometimes the easy recipes are the best recipes. But before I get to this easy recipe, I wanted to talk about something really quick. Cooking. More specifically, beginning cooking. I was asked for a few sentence bio this morning and this always gets me thinking about why I write here at Honey and Birch. What possessed me to start a food blog when there are 1000s of food blogs out there already? The answer is beginning cooking. Before I met my husband, I truly was unable to cook. I reference my first foray into cooking in my About Me section but I have a feeling that anyone that reads it thinks I am exaggerating. It is true – I am a rather new cook. My sister was my maid of honor and in her speech at my wedding she talked a lot about me lack of cooking skills – she may have even mentioned that I was unable to boil water. This, my friends, is a sad fact and brought lots and lots of laughs from my wedding guests. I was terrified of the kitchen. I often undercooked macaroni noodles because I couldn’t tell if the water was ready to put the noodles in. And one semester in college I ate macaroni noodles with olive oil and parmesan cheese every day for lunch and dinner (and skipped breakfast.) I was so afraid to cook anything that I just didn’t. Fast forward to present day. As I am sure you can guess, I’m no longer a chicken when it comes to the kitchen. I somehow conquered my fear and I know other people can too. I am often asked by people who have known me for a long time how I did figured out my way around a knife block and I can hear the hesitation in their voices. They want to lose their kitchen fear too but don’t know where to start. For just this reason, I started tagging some of my recipes with an “easy” tag. Maybe don’t start with chicken fajitas if you’re scared, but my easy caprese salad recipe? Perfect for beginners. So is this recipe. If your white chocolate starts to get cold, just heat it up a little more. Make sure you don’t have blueberries in it though – I made that mistake the first time…. 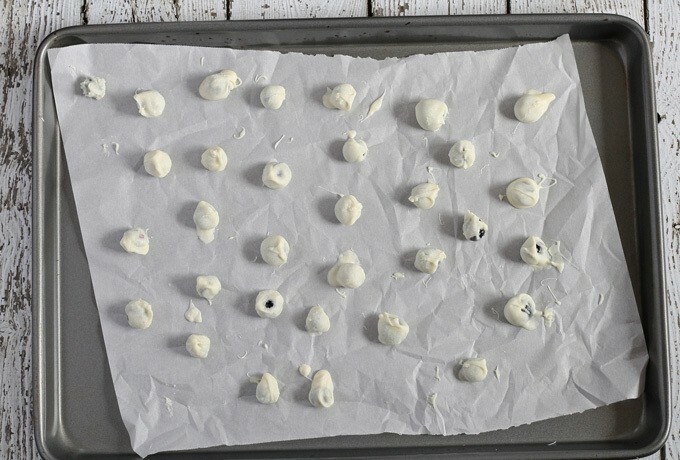 Cover a cookie sheet with parchment paper and set aside. Set up a double boiler over medium heat. Bring 1-2 inches of water to a boil. Add the white chocolate chips and vegetable oil to the top. 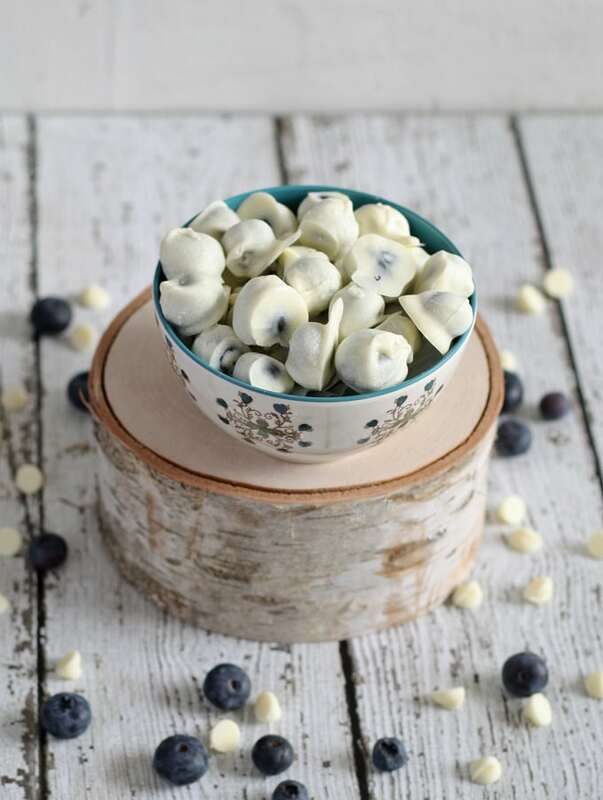 Stir frequently until the white chocolate is completely melted. Turn off heat. 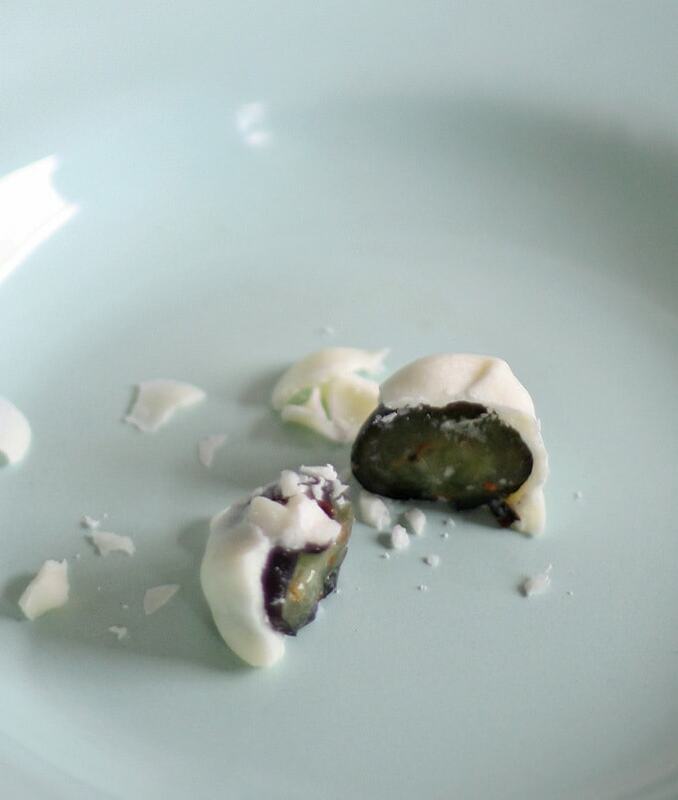 Place several blueberries into the melted white chocolate and cover them completely. Remove using a spoon and place on the parchment paper. Make sure they are not touching each other on the paper. 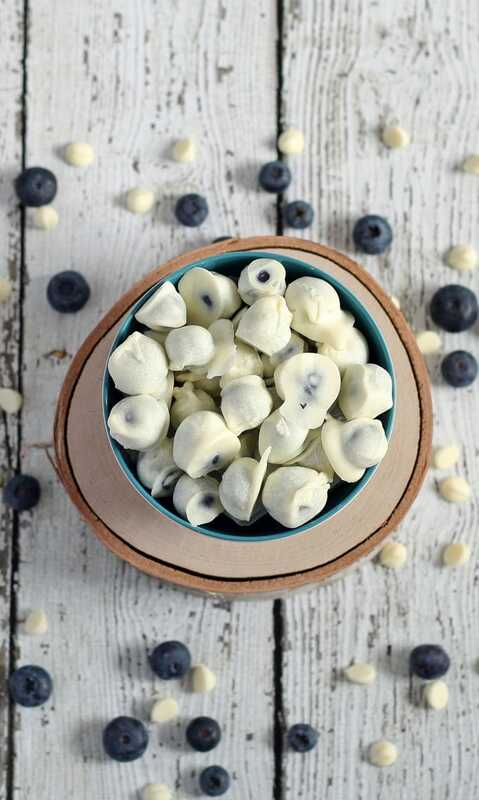 Repeat until all blueberries are covered in white chocolate. Refrigerate for 30 minutes before serving. I couldn’t cook that well either when I got married! It’s amazing how far we’ve come! I’m pinning this for when my blueberries are in season! It is amazing! I am glad I’m not the only one – my family thinks I’m a pariah. ha! I absolutely love chocolate covered fruit. I have never tried to make any of my own. I am so excited to do so using your yummy recipe. Thank you for sharing. PINNED! You’ll love this then Michelle – its super easy! Thanks Catherine!! You’ll love them! Jenny! This is so brilliant!!!! What a great idea for a snack! These look great!! 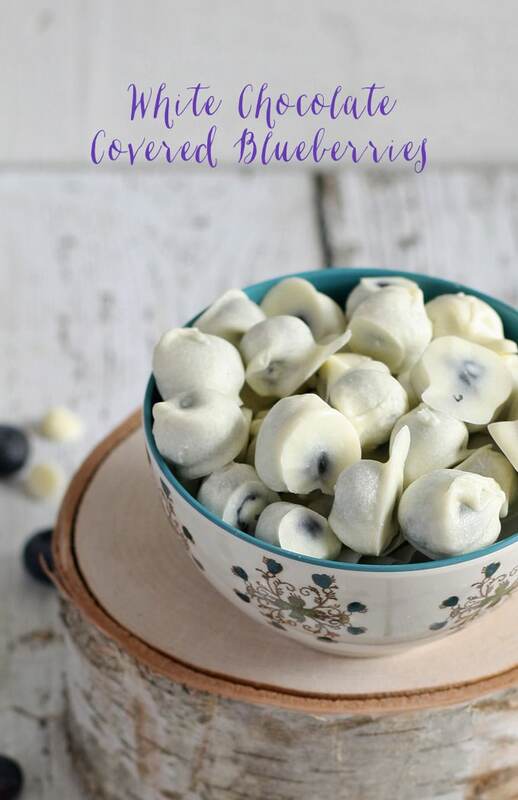 I should definitely make some this summer when the blueberries are in season and are plump and juicy. I can just imagine how wonderful these will taste! I think my girls will love these! Thanks for sharing. These look great! Aldi just had blueberries on special and I know my boys would love this :). I used to be the same way in the kitchen– I burned water once. Yup. This for me is perfection! Pinning! These look like they would taste amazing! And your pictures are just lovely. I wanted to let you know that this was my favorite link up from last week’s Create – Share – Inspire link party!! Thank you so much for sharing, I hope you will stop by again tonight where I will be featuring your link.